What was the result of the recent geospatial leadership summit in Ottawa? What’s the latest update on MASAS? Find out more about these and other Spatial Data Infrastructure (SDI) news, products and events in this April blog. What’s happening in Canada and globally in the world of Spatial Data Infrastructure (SDI)? Find out in this month’s collection of the latest and most significant SDI news, data, products and events. The GeoAlliance Canada Leadership Summit recently held in Ottawa provided a forum for discussing the evolution of geospatial information production, dissemination and use in Canada. The community leaders adopted GeoAlliance Canada as their new national umbrella organization. Its formation is the culmination of efforts by the Canadian Geomatics Community Round Table to bring the community together and enable the Pan-Canadian Geomatics Strategy. The Defence Research and Development Canada’s Center for Security Science will take on the management of the national Multi-Agency Situational Awareness System (MASAS) while continuing to transition MASAS to a new national governance and business operations model. This marks the start of MASAS’ transition to a self-sustainable, resilient and long-term operational entity. In at least one way, the federal government’s new map of Canada pales by comparison to its predecessor, thanks to a generous splash of white across the top. The change has to do with the way Arctic sea ice is represented relative to the 2006 version of the map. TomTom’s annual Traffic Index, which measures traffic congestion in over 200 cities worldwide, revealed rising congestion levels around the globe. For the first time, the Index also measured the impact of rush hour traffic on the work week, uncovering that evening rush hour nearly doubles the travel time for car commuters in Canada's busiest cities. To support the U.S. president’s Climate Data Initiative, the White House recently announced a series of data projects and partnerships that includes more than 150 new open datasets, as well as commitments from others to cultivate climate analysis. The new datasets are all related to health, and are among the 560 climate-related datasets available on Data.gov, the U.S. government’s open data portal. Since 2013, Australian governments at federal, state and territory levels have talked about the benefits of open data and are taking steps to open up more and more data to the public. The common rhetoric is that making this data readily available will lead to innovation. As the mechanism established by the Australian governments to deliver a nationally consistent geospatial information infrastructure for use within the economy, PSMA Australia sees it as part of their mission to drive this open data debate beyond rhetoric and towards outcomes. Flash floods kill more people each year than tornadoes, hurricanes and lightning combined, while droughts devastate entire landscapes. 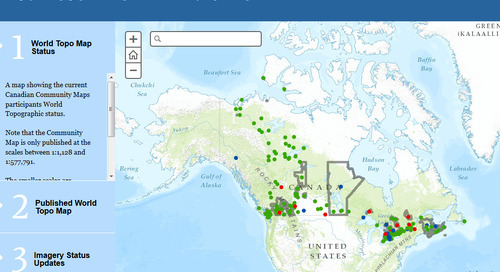 To provide users with the latest information on river conditions, Esri is collaborating with business partners and the user community on a map of real-time stream gauges. This map uses ArcGIS for Server’s GeoEvent Extension to parse live telemetry data from stream gauges and update the values in the map every hour. Forecasts are included as well as links to the gauges’ historical time series. The development of new cloud applications got a boost recently with Amazon Web Services’ move to enable researchers to download free satellite images. People can now access more than 85,000 images captured by Landsat 8 – one of a fleet of satellites which the USGS and NASA began launching in 1972 to create moderate resolution satellite imagery of the earth every 16 days. Esri’s Landscape Content Team has announced that MDA’s BaseVue 2013 land cover data is now available in the Living Atlas and as premium content in ArcGIS Online. BaseVue 2013 is a 13-class land use/land cover dataset that covers the globe, except Antarctica, at 30m resolution. It is derived from Landsat 8 scenes from April 2013 to June 2014. Landsat 8 includes two additional bands of data which allow for higher levels of quality and reliability when classifying land cover. Airbus Defence and Space has launched its WorldDEM Digital Terrain Model, a highly accurate standardized representation of bare Earth elevation that can be made available for any point on the globe. This addition completes the WorldDEM portfolio enabling Airbus Defence and Space to provide both surface and terrain elevation information in support of global customer projects. Vancouver Island University offers the Advanced Diploma in GIS Applications post-graduate program in both classroom and online formats. The curriculum is designed to strengthen a student’s understanding of basic geographic and cartographic principles, while gaining hands-on experience in applying these techniques using GIS and remote sensing software. Two years ago, Esri’s Big Data team released GIS Tools for Hadoop – an open source project that allows users to integrate Hadoop (a distributed big data platform) with big spatial data, complete distributed spatial analysis, and move data between the Hadoop Distributed Filing System and ArcGIS for Desktop. This tutorial shows the steps for downloading and starting up a virtual machine (a self-contained portable Hadoop environment), accessing GIS Tools for Hadoop and showing users how to complete analyses on their big spatial data. The growing popularity of Web maps and apps calls for a workforce well versed in building them. That's why Esri has published “Getting to Know Web GIS”, a new workbook that teaches students how to use Esri technology to create Web GIS applications quickly and easily using the ArcGIS platform. Little to no programming is required.